Epiphytic plant with many roots, fleshy, fibrous when they are dry, flexuous, smooth. Leaves fleshy, arcuate or recurvate, elliptic or obovate-elliptic, with acute or obtuse apex, slightly narrowed at the base, long from 15 to 20 cm. or more, broad from 6 to 8 cm. Flower stalk leaving very low on the stem, between the bases desiccated of the old leaves, arcuate or pendent, simple or branchy, bearing many flowers, longer than the foliage. Bracts short, triangular, acuminate, cucullate, from 5 to 7 mm. Flower fleshy from 5 to 6 cm, star-shaped, with very variable color, delicately scented. Sepals oblong-elliptic or obovate-elliptic, acute or obtuse. Petals identical to the sepals but slightly shorter. Lip 1/3 shorter than the petals, 3-lobed, at very cuneate base, shortly pedicelate. Lateral lobes triangular, sickle-shaped, truncated apex, more or less notched, with a flattened callus in middle. Midlobe ovate, fleshy, convex, with a high notched central keel, finished by a flattened callus, covered of short hairs. Disc between lateral lobes provided with a simple callus bifide, sometimes with additional protuberances. At the junction lateral lobes and midlobe there is a long appendix, bifide. Column fleshy, erect, of 8 mm, with very developed clinandre, surrounded of a cap, slightly denticulate. Pedicellate ovary from 2 to 3 cm. This plant is not any more in culture currently. Too much collected, this species seems extinct but some specimen could reappear. "Sepals and petals whitish-rose outside with rows of purple blotches, purple inside, with a few white bars at the base of the petals. Side lacinia (lobes) of lip yellow, white at the top and base, middle lacinia (midlobe) white with much purple, or nearly purple, and with a tuft of hairs at apex." 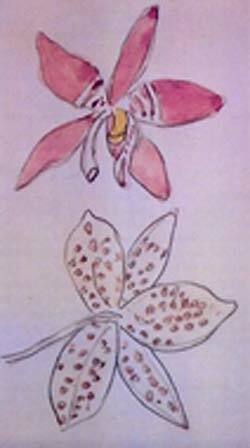 The first clones of Phalaenopsis speciosa were to be primarily mauve,with the base of sepals white more or less decorated of transverse bars mauve, the dorsal face of the tepals white lightly dotted of mauve. White column. The flowers are very scented. Estival flowering. Grow on large trees in very sunny condition, far from the salt breezes from the sea. Product easily keikis. The mangroves are the field of predilection of Phalaenopsis speciosa. They moreover are subjected to very abundant rains throughout the year, with a point of more than 300 mm in September. These rains are hot (21°c). The diurnal temperatures are about 30°c and drop only 5°c during the night. In nature, certain floral stems can reach two meters. A confusion is possible with Phalaenopsis pulchra but a simple observation of the midlobe of lip is enough to make the distinction between the two species. The great variations of colouring of the segments led to the creation of several varieties by Reichenbach. 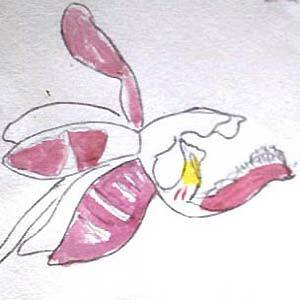 Sepals and column pink purplished. Petals pure white. No white mark on the floral segments. 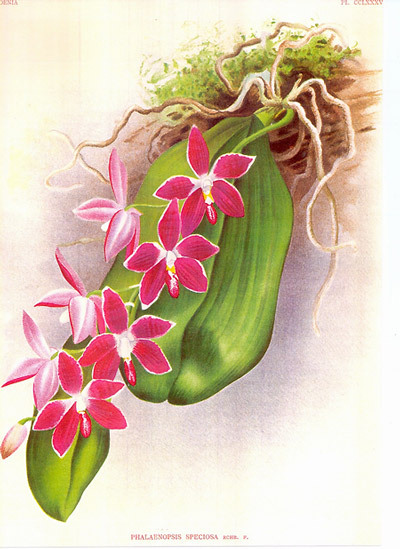 This type was a source of error because of its resemblance to Phalaenopsis pulchra, although details of the flower and origin of the species is different.